At first sight it would seem that the candles were naturally used only to illuminate the midnight festivities, but the evidence points to the burning lights being part of the ritual. This is also suggested by the importance, in the cult, of the early-spring festival of Candlemas; a festival which has long been recognized as of pre-Christian origin. The light is particularly mentioned in many instances as being carried by the Devil, usually on his head; the witches often lit their torches and candles at this flame, though sometimes it seems that the Devil lit the torch and then presented it to the witch. To call the chief of the cult Lucifer was therefore peculiarly appropriate, especially at the Candlemas Sabbath. 3. Pitcairn, i, pt. ii, p. 246. The ploughman, Gray Meal, who took a large part in the ceremonies, was an old man. flauchter'. The Somerset witches stated that, when they met, 'the Man in Black bids them welcome, and they all make low obeysance to him, and he delivers some Wax Candles like little Torches, which they give back again at parting.' The light seems to have been sometimes so arranged, probably in a lantern, as to be diffused. This was the case at Torryburn, where the assembly was ht by a light 'which came from darkness', it was sufficiently strong for the dancers to see one another's faces, and to show the Devil wearing a cap or hood which covered his neck and ears.' The latest account of a witch-meeting in the eighteenth century describes how the witches of Strathdown went to Pol-nain and there were 'steering themselves to and fro in their riddles, by means of their oars the brooms, hallooing and skirling worse than the bogles, and each holding in her left hand a torch of fir'. There is one account where the candle was for use and not for ritual. John Stuart of Paisley, in 1678, admitted the Devil and some witches into his room one night in order to make a clay image of an enemy. 'Declares, that the black man did make the figure of the Head and Face and two Arms to the said Effigies. Declares, that the Devil set three Pins in the same, one in each side, and one in the Breast: And that the Declarant did hold the Candle to them all the time the Picture was making.' John Stuart was the principal person on this occasion, and therefore had the honour of holding the light. The description of the event suggests that the saying 'To hold a candle to the Devil' took its rise in actual fact. The material of which the candles or torches were made was pitch, according to de Lancre, and at North Berwick the lights were 'like lighted candles' burning with a blue flame. 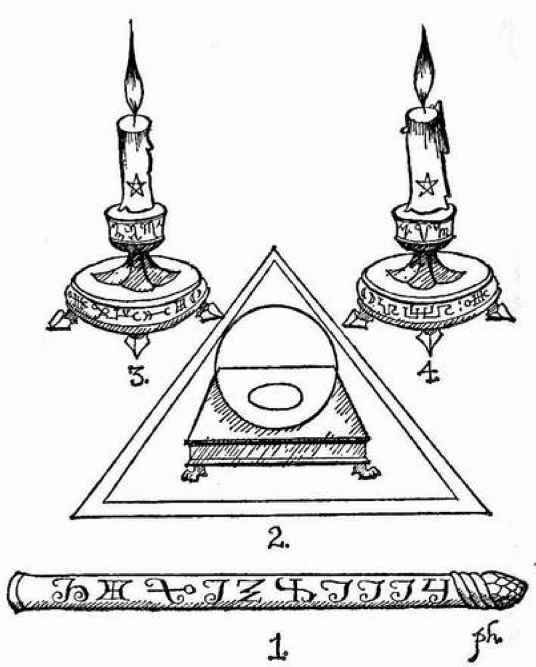 The white candle seems to have been essentially the attribute of the devil, the black candles or torches being distinctive of the witches. That the lights burned blue is due to the material of which the torches were made. The evanescent character of the light, when a wisp of straw was used, is noted in the evidence of Antide Colas.